If you want to create the most astonishing Hollywood style video with image crisper than that of ordinary 1080p HD video clip, there's little question as to why you should add a 4k video editor to your video toolkit mix. Video buffs who are out to lunch are accustomed to the generally video editing software. But if you don't want to be left behind, take a look at the best and most trustworthy 4K video editing tools, as they will suffice not only for 4K video to smaller size compression but also for some extra function of being an 4K video converter. Plus, the recommended 4K video editing programs have access of almost any formats, which is supreme compared with editing 4K in iMovie. But before we start the 4k video editor round-up, keep in mind that you own a computer powerful enough to run 4k video touchup. 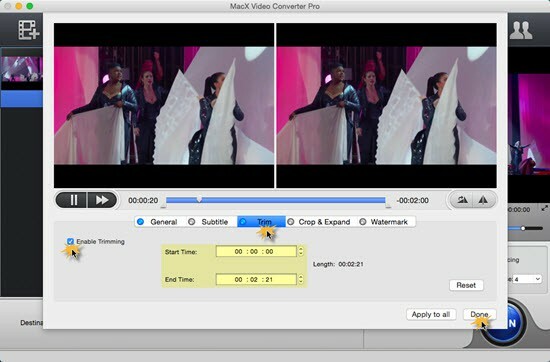 MacX Video Converter Pro is a state-of-art video editing software for 4K ultra HD that processes all 4K video involved issues, such as editing, converting, downloading, recording, etc. It leads the industry by supporting the latest HEVC/H.265 codec, letting you easily convert 4K video to MP4 MOV AVI MKV FLV WMV SWF VOB MPEG MP3 iPhone ringtone, etc. 180+ video and 14+ audio formats. As for the 4K video editing feature, it supports you to trim 4K video duration (free set Start Time/End Time), crop 4K UHD video by moving the marquee to resize 4K video display, add subtitles/watermark to 4K video, split/merge 4K video clips and adjust 4K video parameters (Bit rate, frame rate 60/30p to 24p, aspect ratio 4:3 to 16:9 or vice versa, etc.). On top of 4K video editing feature, what's also worth a mention is that this cover-all 4K video converter is also the strong performer to free download 4K movies from YouTube, Dailymotion, Vimeo, Facebook, Metacafe, etc. 1000+ movie video sharing sites with whatever format and resolution. Thanks to its advanced Intel QSV/Nvidia/AMD hardware acceleration tech, it acclerates the 4K video processing up to 5X faster than any other video converting program. Convert a 200+GB 4K movie to MPEG-4, MP4, WMV and FLV that output smaller video size. Multi-core CPU, multi-thread tech and Intel QSV/Nvidia/AMD hardware acceleration tech enable to process 4K ultra HD at No.1 fast speed. PowerDirector continues to outflank its competitors, with fastest previewing and rendering, a mass of 4K video editing software, though sometimes difficult to be found among so many options. Above all, After its latest update, this consumer-focused video editing software now supports editing 4K Ultra HD, H.265/HEVC, AVCHD 3D/Progressive. So whether you're willing to edit must-watch 4K movies or a simple YouTube 4k video, PowerDirector is the station where you will be satisfied. Supporting 64 bit processor, this 4K UHD video editing tool offers fast 4k video editing. But you need to download a 6GB RAR file in case you download this 4k video editing software on your windows 7/8/10 computer. Please bear in mind that there is no Mac version in the 4k UHD video editor and rare crashes with intensive operations in the test of 4k movies editing. linear timecode display and storyboard mode. 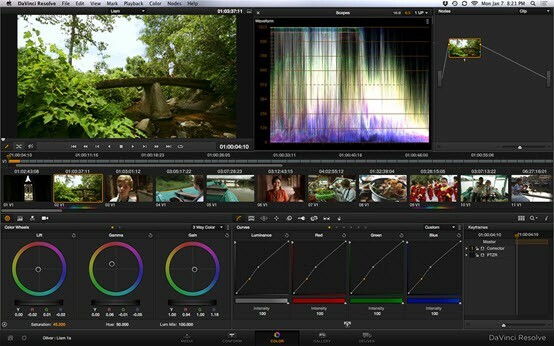 Another 4k video editing application that is thought to be at the highest end is the Final Cut Pro X from Apple Inc. This 4K video editing software supports a wide range of formats, say 3GP, AVI, MP4, MXF, QuickTime, etc. Now up to version 10.2.2, it is used by both professionals and amateurs, along with other filmemakers. The video editor supports 4k videos and movies, including the hot Jurassic World. Final Cut Pro is the best 4k video editing software for Mac with a number of awesome features such as an intuitive UI, useful keyboard shortcuts, etc. But not all Mac users can use the Mac video editor. Only users of Macbook Pro with Tunderbolt 2 and new Mac Pro can edit video in 4K resolution. Support a wider range of video formats, including the ability to import and export broadcast compliant MXF files. Fast, with 64-bit and multi-core support. P.s. If you haven't the 4K video clips stored on computer, you can also utilize the best 4k video downloader to get 4K video downloaded free at first. 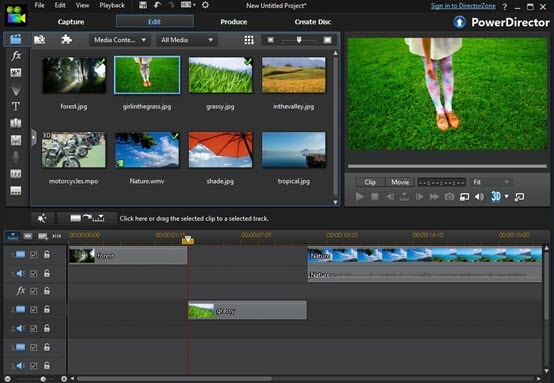 The famous non-linear editor (NLE) Sony Vegas Pro is one of first-class high-end video editing software with 4k HEVC support. This is by no means a conclusive ranking of all 4k video editor software — these are 3 of the best. Certainly, they're not suitable for those budget conscious people because of their a bit higher price tags, but you'll get what you're paying for. High-end features and experiences are usually bound to high-end prices.